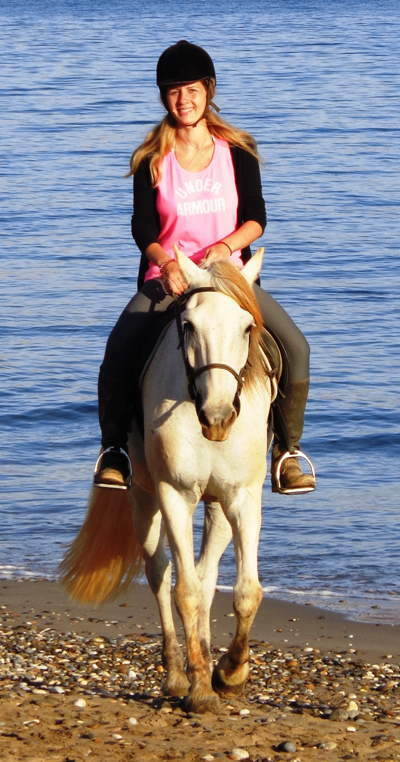 This short guided equestrian break is a perfect choice for those who wish to explore the beauty of the Cretan country side, but do not want to miss out on a beach ride either. Consider this as an invitation for a truly unforgettable riding holiday. Or choose the dates that are the most convenient for you. Guaranteed departure starting from 2 persons. For advanced riders there is also an unguided version of this trail available. A detailed road book will be provided. In this case, the trail without food costs 499.- Euro per person. A minimum of 2 persons remains required. Day 1: From the ranch we will head down to the beach for our rendezvous with the long sandy beach of Kavros, giving great opportunities for some amazing (slow) gallops. A real adrenaline rush! Mainly over country roads and through olive groves we will then set way to the beautiful green blue lake of Kournas. With the surrounding mountains reflected in the lake, this little paradise makes a perfect location for lunch at a local restaurant. Possibility to discover the lake by paddle boat and around 16.00 we'll head towards Kastelos and ride through the almost abandoned village of Patima, to reach the greenery of Argiroupoli village. This village is well known for its springs, ancient mills, avocados and associated products. Dinner at a local restaurant and night spent in Argiroupoli. Hours riding: 8, morning (4) & late afternoon (4), large lunch break, short stops during the ride. 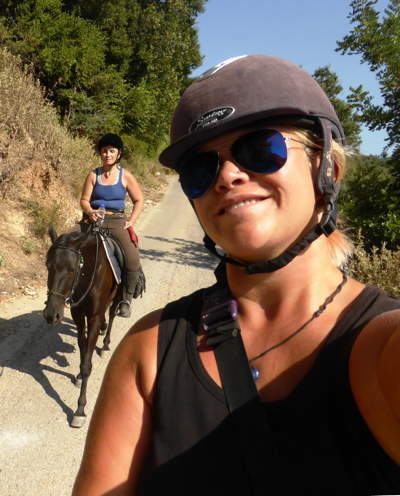 Day 2: Continuing on our trip, we will ride through the village of Kato Poros which has been renovated in traditional style and the fun will continue along shady dirt tracks through unspoiled countryside. 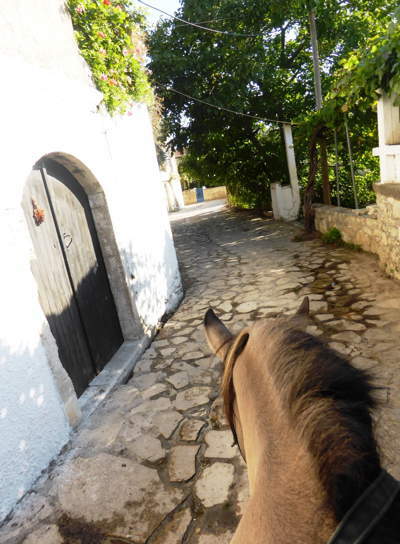 At the old village of Nisi we will enjoy a short stop to visit an ancient olive oil factory and riding gently up-and downhill we will make way to Moundros where a nice Greek coffee will await us. This magnificent trail will lead us to the tiny villages of Ano Malaki and Kato Malaki, where we will stop for a picnic. 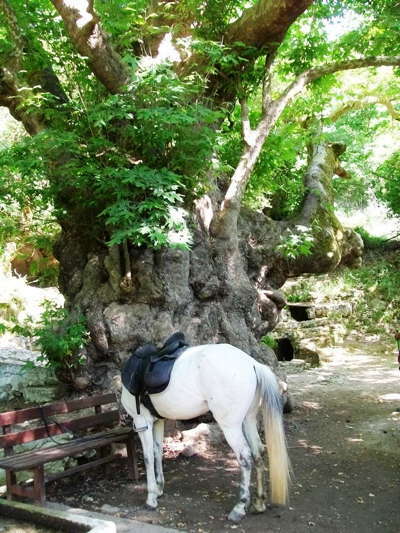 With our batteries recharged we'll ride through the small mountain plateau of Potamia which is an oasis of plane trees and springs. Nature pure! Getting lost in the panoramic views along the way, we'll reach the old Venetian settlement of Ano Valsamonero. 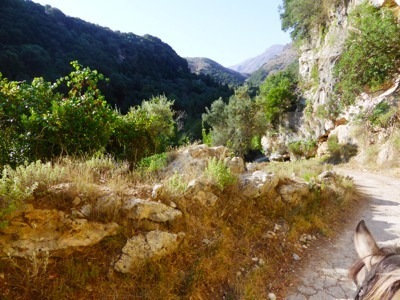 Mainly over shady dirt tracks we will follow the riverbed down to Kalonyktis, a village styled with traditional architecture and Venetian buildings including a mill. From there we will head down to Agios Konstantinos where we'll spend the night. Hours riding: 7, morning (4) & late afternoon (3), lunch break + short stops during the ride. Day 3: Setting way through rural landscapes down to the Chapel of the Five Virgins and the 2000 year old plantain tree towards Karoti, followed by another off road adventure to Episcopi and then further downhill all the way to the beach. A perfect location to have a swim with the horses if the sea is calm enough. The horses will appreciate their lunch break in the shade while the riders will enjoy a delicious lunch at a beach tavern. Relaxing on this sandy beach is next until it is time to saddle up and round off this unforgettable trip with an amazing sun set beach ride. 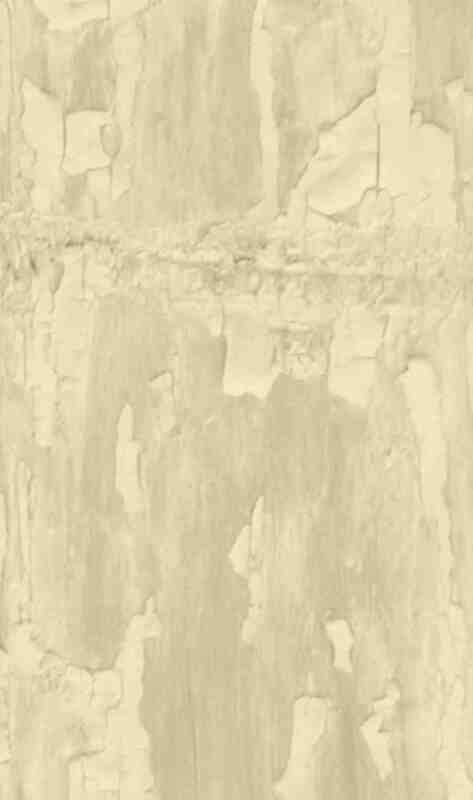 Hours riding: 6; morning (2.5) & late afternoon (3.5), large lunch break, some short stops during the ride. The 2 nights on the trail ride are spent in clean traditional rooms with private bathroom and A/C. Continental breakfast (*2), lunch (*3) and dinner (*2) during the trail ride are included. Drinks are at your expense.